Bess Crawford Mysteries | annie's got a clue . . . 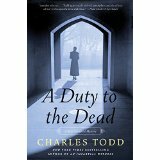 If you haven’t read any of the Charles Todd mysteries — featuring London Inspector Ian Rutledge and WWI nurse Bess Crawford (in separate series) — you should. I’ve particularly enjoyed the historical setting of the Bess Crawford novels, focused on WWI, both in Britain and in France. War as a character looms large in each of the books. The mother/son duo Charles Todd paint a starkly realistic picture of life during WWI, with particular emphasis on the impact of PTSD (though not yet-named) and influenza, and how the conflict was devastating to many other than the soldiers. Bess Crawford’s character lightens the tone just enough to take the books from a slog through death and disease to a slightly gritty (but still comfortably British) mystery. Bess is far from flippant. She is tough, smart, loyal (almost to a fault), stubborn, brave, but also steadfastly optimistic about humanity and the human spirit in general. Bess’s father, a retired Colonel who used to be stationed in India, and his aide, Simon, make for an entertaining supporting cast (along with Bess’s mother, fellow nurses and her London landlord). 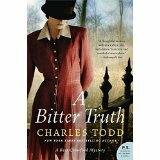 Charles Todd comes back to these characters throughout all of the novels, painting a vivid picture of Bess’s world and the support system that gives her the drive and confidence to continue her quest for fairness and justice (a common theme in each book). There are seven books (so far) in the series, and I enjoyed them all. But some more than others. The first novel, A Duty to the Dead, is probably my favorite. In it, Bess is tasked with giving a message to the family of one of her patients who died in an army hospital. She was very fond of the patient — possibly in love with him — and when she visits the family to pass on his message she discovers a dark family secret, a hidden brother and just a touch of danger. In this book we are introduced to Bess’s compassion and doggedness. The mystery is very compelling and heartbreaking. Another good one is A Bitter Truth. In this novel, Bess gets swept up into the family drama of a battered wife who she finds hiding out on her doorstep during a bad storm. Rather than take advantage of her precious few days of leave, Bess takes the woman in and accompanies her home, to face her family and her husband. It is probably the most “feminist” of the books. Bess clearly would have been a bra-burning, Ms. magazine-reading young woman were she not born seventy years too early, and this gives us a taste of that side of Bess. She fiercely protects a woman who she hardly knows and jeopardizes her own career and reputation in the process. 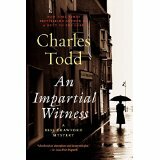 Another of the books I really enjoyed was An Impartial Witness. In this book, Bess accompanies a severely burned patient, Lt. Merriweather, home to England from France. She has nursed Merriweather in France and knows how devoted he is to his wife — her picture is literally pinned to his patient gown. Bess feels like she knows the wife. She delivers Merriweather to a nursing home in England and on her return to London she sees his wife at the train station, in tears and clinging to another soldier. Within days, Merriweather’s wife is found murdered, and he dies from burn complications (or perhaps because he received news that his wife died). Bess goes to the police with her information and by virtue of her identification becomes involved in a tightly drawn, and particularly nasty mystery. A few more bodies turn up before the mystery is solved and the extremely high price of war becomes painfully clear. Throughout the novels, Bess has sort of a flirtatious, “older brother” thing going on with Simon, her father’s aide. He is a little older than Bess, always around to get her out of a jam, and clearly in love with her. My one beef with the books is a bit of a Sam/Diane thing with a will they or won’t they get together? I think the authors should simply wrap up that plot line, but maybe a little uncertainty isn’t a bad thing, particularly in a mystery. Pick up a Bess Crawford and Happy Reading!